CHANNEL ISLANDS HARBOR — A ribbon cutting ceremony Jan. 24 that included local dignitaries marked a major expansion to the American Tall Ship Institute’s boat-building program. The ceremony was held at the new, much larger space at Fisherman’s Wharf, on the east side of Channel Islands Harbor. The institute’s public relations and marketing manager, Donna Reed, thanked the assembled group for coming to the special event, and she outlined new offerings to come. “In the past two years, our boat-building shop only covered about 700 square feet,” she said. “This meager space could only allow for one boat-building class at a time. In that time, nine boats were built with nearly 80 area youths involved, over the past two years. Reed, who spent eight years as a radio talk show host, followed by several years in the real estate industry, said she got involved with the American Tall Ship Institute because she wanted to chase a different kind of dream — one where money wasn’t the end goal. 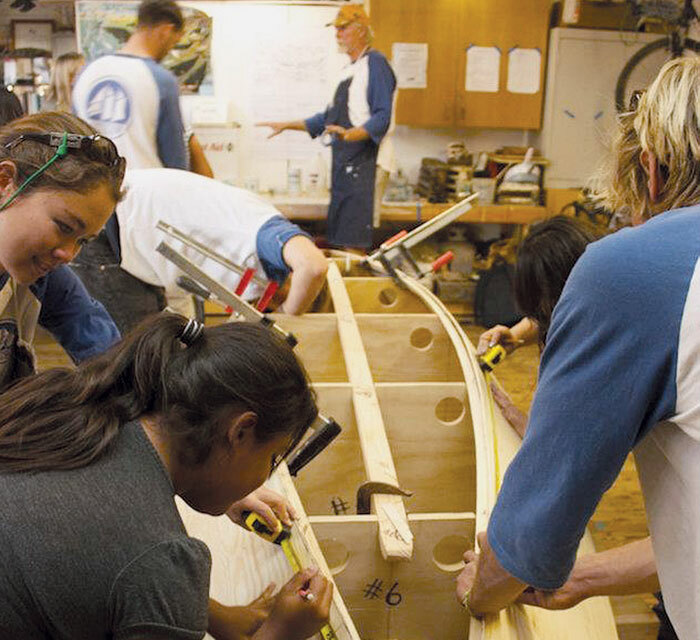 The boat-building program is an adjunct to the student training program on the institute’s tall ship Bill of Rights, also located in the harbor. Taylor said he is ecstatic about what this program expansion means to youth in need and the community at large. “I can hardly believe we are here and ready to move forward with larger classes, supporting more youth — and reaching out to the community, as well,” Taylor said. Reed explained that the boat-building courses are directed toward helping gang-involved teens, underserved youth and young adults, fostering teamwork and developing critical job training skills in a unique and valuable way. “We are lucky to have two master boat builders with decades of combined experience — Philip Taylor and Doug Sherr — to guide and teach the kids,” Reed said. “The students not only learn the theory of boat building, but the vocational math needed for building a boat, too. Reed and Taylor said they are thankful for Krieger’s help in finding available space for the fledgling nonprofit organization among the empty buildings on the harbor’s east side, an area that is in need of redevelopment. Ventura County is charging the organization $500 per month for the use of the space, for up to one year. “We hope that a year from now, we will be able to continue a lease here or find another space, depending on what happens as far as redevelopment for the Fisherman’s Wharf area goes,” Reed said. The new workspace represents a major increase in area for the organization — from 700 to 2,500 square feet. With this new work area, Reed is planning a program expansion to reach not only gang, at-risk and underserved youth, but also veterans who are looking for new skills and other members of the community. The entire size of the new location is 3,600 square feet, which also allows for expanded office space. In the last month, the American Tall Ship Institute team remodeled the former Buon Appetito restaurant space into work space to serve four programs operating simultaneously. The American Tall Ship Institute has partnered with Ventura County Community Foundation, City Impact, and the Boys and Girls Clubs, just to name a few organizations, helping direct youth at risk and others to the institute, and its sailing and boat-building programs. The organization held an inaugural Pirate Gala fundraiser March 2 at Channel Islands Maritime Museum, to help pay for the haulout of Bill of Rights for needed annual maintenance. To volunteer time to the American Tall Ship Institute or to donate, call Reed at (805) 901-0585 or email sail@americantallship.org.